The Versatile and Entertaining Caribbean musical sensation. This awesome four-member group features the talents and creativity of prolific songwriter, arranger and energetic showman Richard ‘Richie B’ Parris on keyboards, lead and back ground vocal. Keeping the pulse is the naturally gifted and flamboyant Noel Parris on drums. The Genius Oliver (Pluto) Mensah solidifies the foundation with his remarkable feel, quick fingers and flair on the bass and lead vocals. Complementing the rhythm section, is the amazing Avi Kayne with his nifty strums and awesome leads. Universal Xpression is synonymous with quality, variety and originality. It is absolutely amazing to hear different styles of music done so well by one group. ‘Beautiful’ says Minister Louis Farrakhan, and ‘Amazing’ says Calypso Rose. The group has amassed a loyal following and numerous accolades in 20 years. ‘Best Live Music’ for nine consecutive years in the Detroit Carnival Parade. ‘Best Live Music’ Mecca Parade, San Francisco. Universal Xpression has released fifteen excellent albums of original music. In 1997 Universal Xpression had the number 1 and 2 Best Sellers in the Virgin Islands and Album of the Week on WAVS radio in Miami, Florida. From the Christmas on the Beach album, ‘Santa Baby’ was also Number 1 in 1997. In 1999, the single ‘Meow’ was number 1, and was featured for four weeks on BBC Radio in England and ‘Cest’ si bon’ was number 2 in the Virgin Islands. Besides appearing in numerous commercials, Universal Xpression has shared stages with such great Caribbean international performers as Percy Sledge, Beenie Man, Shaggy, Luciano, Calypso Rose, Mighty Sparrow, Arrow, Burning Spear, The Manhattans, Maxi Priest and Wayne Wonder. 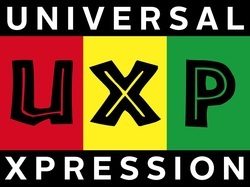 Universal Xpression has thrilled thousands all over America, Canada and the Caribbean at numerous venues: High schools, colleges, universities, clubs, festivals, weddings, parades, corporate parties, and parks. In twenty great years the group has built a tremendous fan base which continues to grow with every performance. ‘Music is spiritual, emotional and mental food’ says Richie B. Seeing Universal Xpression live is an awesome experience of strong and beautiful vocals, sweet harmony, solid and tight groovy music topped off with wonderful showmanship. The music flows through them and you are embraced and involved in the mental, physical, educational and emotional awe. Universal Xpression is ultimately satisfying. Roots Vibrations founder and lead singer Winfred J's Julien, hailing from Dominica, West Indies, has been the driving force in the regional Caribbean and Reggae scene for more than three decades. He produced and performed on eight original CD’s and has worked with dozens of international, national, and local artists, including Calypso Rose, Burning Spear and Yellowman. 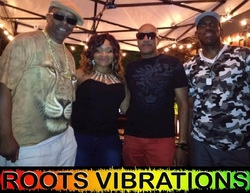 Roots Vibrations has delighted audiences throughout the U.S.and Canada with their unique blend of original and popular Caribbean music in Reggae, Zouk, Calypso, and Soca styles. Demand for the band has continually increased. Over hundreds of shows and constant practice and rehearsals, Julien and the band have honed their product into a real tight crowd-pleaser. He said, "My philosophy is ensuring a great performance by each member of the band. The show stays interesting by playing a mix of original and familiar music in a variety of Caribbean styles. The awards we receive and the response we get is because the audience is our focus. Each show is unique to the vibe of the audience and the diverse new material we incorporate." Roots Vibrations' music is always uplifting, educational, and rhythmically stimulating for people of all descriptions. Any time Roots Vibrations performs, it's a good time. Hailing from the island of Dominica, Winfred developed his passion for music, listening to artists including Bob Marley, and Stevie Wonder as well as many of the pioneering Dominican musicians like Exile One and Grammax Intl. He became a master singer, songwriter, producer, bandleader, and recording artist. His performances as a member and leader in classic Detroit Reggae bands, including Sirius Roots, King David, Bandulu, Universal Spectrum, Expression and since 2000 Roots Vibrations, define him as a leader in the industry. He opened for superstars like Buju Banton, Shaggy, Shabba Ranks, and Sanchez. His recordings are entitled "Give Thanks" "Detroit Live Sessions, and "Only You," which was nominated in 2015 and “Higher Calling” was nominated in 2017 both for a Detroit Music Award. For many years he co-hosted and produced the "Reggae International" radio show on WDET with his brother, Michael "Mikie Dread" Julien. A native of Detroit, MI with African, German and Native American Indian roots, La Keisha has a performance resume that spans various music genres such as: Jazz, Traditional, R&B, Gospel, Big Band, Classical Opera, Latin & Reggae. Aside from being a vocalist, La Keisha is also a songwriter, actress and dancer. Music captivated her at a very young age, and she aims for longevity in creating and performing music that has the ability to touch many lives across the world. Ten Wade is a keyboard specialist and is proficient in many other instruments as well. His influences include Herbie Hancock, Billy Preston, and Method Man, among others. He has toured extensively and has performed in many diverse arenas ranging from Broadway to Las Vegas to Hollywood. He has been on the local Detroit music scene since 1993 and is an extremely accomplished arranger and composer also. Ten is music director and offers his prodigious keyboard and vocal skills to Roots Vibrations. A multi-talented bass player and singer started as a teenage performer in Dominica. He has a groove with a touch that is genuine roots. He is influenced by Peter Tosh and Kymani Marley. Has performed on stage and in the studio with such national acts as Stevie Wonder, Five Special, Johnny Griffith, and many others. He rocks with sweetness and has the rare ability to play reggae as well as the numerous other Caribbean rhythm styles, including Soca, Zouk, and Calypso.